Pembrokeshire-born chef Tom Simmons, who appeared on MasterChef – The Professionals, has opened his first restaurant in London at Bermondsey’s One Tower Bridge development. Known as ‘cwtch’ in the planning stages (which, as anyone who has seen Gavin & Stacey will know, is Welsh for hug) Restaurant Tom Simmons focuses on both British and French cuisine, with an emphasis on the chef’s Welsh heritage. Tom is at the helm in the kitchen, as partner Lois Thomas oversees the front of house. The restaurant is the first to open in the brand new One Tower Bridge development, with The Ivy Tower Bridge to follow later in July. 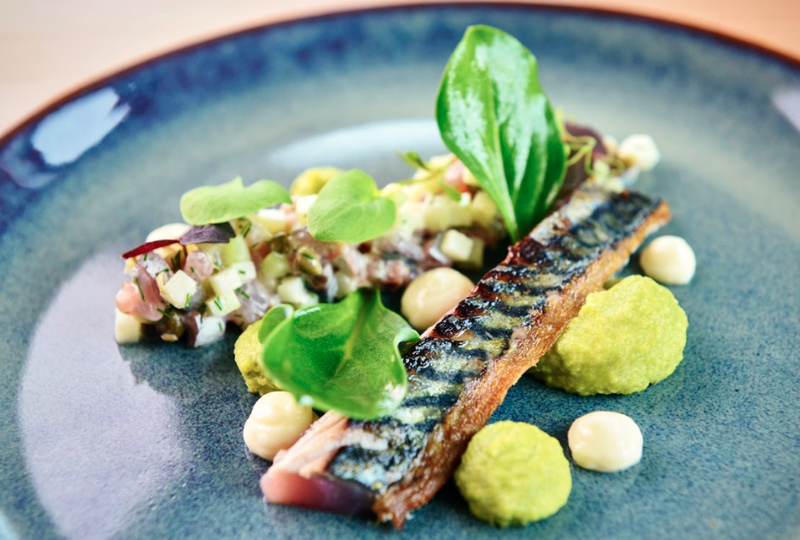 Open for brunch, lunch and evening service, the menu features dishes such as: Crab & Fennel Risotto, Dill Mascarpone, Sorrel; Lamb Rump Pommes Anna, Peas, Courgette, Feta; Monk Fish, Butter Beans, Red Peppers, Lemon Oil; and Pineapple Tarte Tatin, Coconut Ice Cream. Favourite dishes are available as small plates to enjoy at the bar, or for the table; pre-dinner nibbles include one-off originals, such as cockle popcorn with laverbread mayonnaise. Tom uses ingredients from chosen suppliers that showcase Welsh lamb from Preseli Blue Stone, Orkney scallops from Keltic Seafare, foraged mushrooms from Fine France, and much more. Speciality beers and quality wine by the glass sit alongside a wide-ranging list of bottles from importers OW Loeb. Tom was the youngest competitor to reach the quarter-finals in MasterChef – The Professionals back in 2011. Most recently, he headed up the kitchen at Wolfscastle Country Hotel. He has also worked in kitchens alongside Mark Sargeant and Tom Aikens. Influenced by Tom & Lois’s’ Welsh roots, the split level dining room (with mezzanine) is decked out in mostly natural materials, with wood panelled walls, a slate bar and Welsh oak tables. The colour palette is a blend of earthy tones and the walls display scenes from the Welsh countryside. Tom says he looks forward to cwtching* up with his guests this summer! News cwtch, Gavin & Stacey, Keltic Seafare, Lois Thomas, London restaurants, Mark Sargeant, MasterChef: The Professionals, Modern British restaurants, One Tower Bridge, OW Loeb, Preseli Blue Stone, sharing plates, The Ivy Tower Bridge, Tom Aikens, tom simmons, Welsh restaurants, Wolfscastle Country Hote. permalink.